Are you eying the Motorola DROID RAZR, but don’t have the funds at the moment to pick it up? Well, if you happen to live the Los Angeles area, you’ll have the opportunity of scooping one up in an upcoming scavenger hunt being hosted by Motorola and musician Cee Lo Green – yes, you heard that right, Cee Lo Green people! Essentially, the Grammy Award Winning artist will be hiding a Motorola DROID RAZR in white somewhere within the Los Angeles area today. Actually, the city-wide scavenger hunt will be happening from noon to 6 PM PT. Clues for the location of Cee Lo’s holiday elf carrying the DROID RAZR by Motorola will be posted on Moto’s Twitter feeds starting at 2:00 PM PT. Do you want to participate, but don’t live in the area? Well, there’s still good news for you seeing that you’ll have the chance to win the DROID RAZR via Twitter as well, because Motorola is giving everyone a chance to win one of six devices by using the #WhiteRazrXmas hash tag in their tweets. For this Twitter contest, it’s actually starting at 4 PM CST today, December 20th, and will go on until Christmas Day, December 25th. LIBERTYVILLE, Ill., - Dec. 20, 2011 – In case you didn’t make the “nice” list this year, you have another chance to get the hottest smartphone available this holiday season. Grammy Award Winning recording artist Cee Lo Green, and Motorola Mobility, Inc. are making the holidays white for Los Angeles residents through a city-wide scavenger hunt for the ulimate winter prize: the festive DROID RAZR™ by Motorola in white. 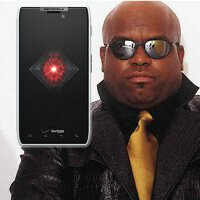 On Tuesday, Dec. 20, Cee Lo will hide a DROID RAZR by Motorola in white somewhere within the Los Angeles area. Throughout the day, he will tweet clues to its location and direct participants on a holiday scavenger hunt. The first three Los Angeles residents to follow the clues to locate Cee Lo’s holiday elf carrying the DROID RAZR by Motorola in white will have a chance to take home this brand new smartphone. DROID RAZR by Motorola in white is a special treat for anyone on your gift list. As the thinnest 4G LTE smartphone available, this smartphone packs strength and smarts into a stylish, impossibly-thin package. Built with KEVLAR® fiber and a Corning® Gorilla® Glass display, the DROID RAZR by Motorola in white delivers cutting-edge visuals and innovative, software. MotoCast™ is a free Motorola solution that lets you stream or download your music, pics and more from your home or work PC to your phone – virtually anytime, anywhere. With the Smart Actions app, DROID RAZR is smart enough to extend battery life so you don’t have to worry about being caught without a charge on the last few shopping days. Plus, it will be upgraded to Android™ 4.0 Ice Cream Sandwich, making it a gift that will truly keep on giving. *For complete rules and regulations on the scavenger hunt, please visit http://moto.ly/clg. For official rules and regulations on the Twitter Contest, please visit: http://moto.ly/r4. DROID RAZR by Motorola in white is available in Verizon Wireless Communications Stores and online at www.verizonwireless.com for $299.99 with a new two-year customer agreement. Customers that purchase a DROID RAZR will need to subscribe to a Verizon Wireless Nationwide Talk plan beginning at $39.99 monthly access and a smartphone data package starting at $30 monthly access for 2 GB of data. Customers will receive $100 off a DROID XYBOARD by Motorola tablet and $50 off select Motorola accessories for a limited time when a customer purchases a DROID RAZR by Motorola with a new two-year customer agreement. For more information about Motorola products, please visit www.motorola.com. i know. they should have released white first and used him for the black one. Forgive me for saying this Cee Lo...but Lawrence Fishburne made for a way better Morpheus in the Matrix Series.